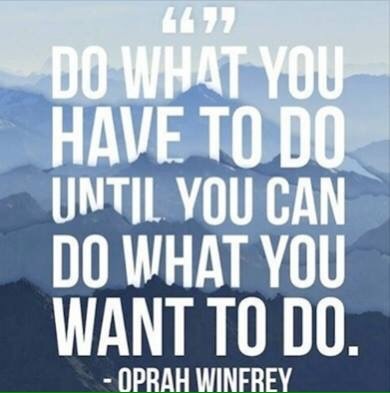 I had to share this quote from the top inspirational lady herself Oprah Winfrey. If you must clean toilets, be the best damn cleaner there is. If you must flip burgers, just make sure you washed your hands first since you just cleaned the restroom, and be the best cook ever. If you are a barista just make sure you don’t spill coffee grains into the mix and you make my latte with that foam of love. You know who you are. If you are an illegal or legal immigrant trying to feed your family and make ends meet, you are what makes America Great and your hard work ethics are needed in our country right now. If you are a first responder dealing with the catastrophic storms in California we honor all of you. To all the teachers out there, don’t expect nothing less than the best and your students will always remember. Thank God for my schools and universities which lead me down the path to personal achievement and degree advancement. Stay in school but dare to break from your old rules. Remember the best is yet to come. Due diligence is the operative word of the day.